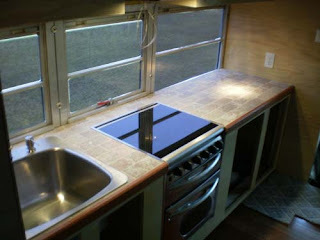 Today I installed the last upper cabinet light in the kitchen and installed the sink. The lights that are in the upper kitchen cabinets stick up on the inside of the cabinet so I took a piece of wood and cut the same diameter hole in it as I had cut in the cabinet. 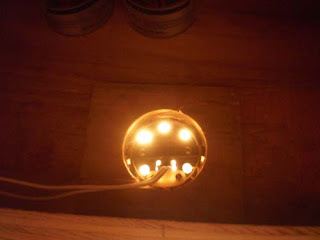 Then I slide it around the part of the light that sticks up in side the cabinet. 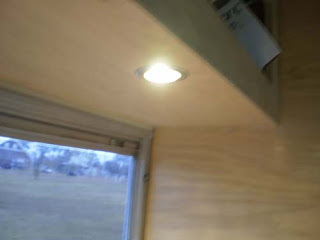 This provides a sort of shield for the light so that nothing placed inside that cabinet can push the light back out. Here are all the lights (including the stove vent lights) illuminated. 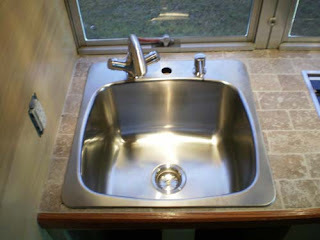 Here is the sink installed with the faucet and soap dispenser in place. The center hole will be capped. 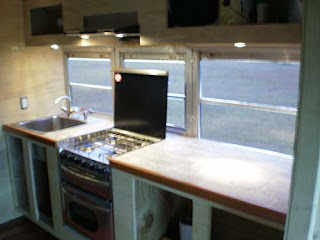 Here is another view of the kitchen. Notice the hood vent now sports its stainless finish. I striped the protective white coating off.